NEW CANAAN, CT – October 1, 2004 – Preliminary results for the third quarter, ended September 30, 2004, indicate a 34% decline in total venture capital committed to the health care markets, and a 15% decrease in the total number of investments, compared with the previous quarter, according to Jenks Healthcare Business Report, published by Irving Levin Associates, Inc., a research and publishing firm tracking financial activity in the health care markets. During the third quarter, a total of 94 venture capital investments amounting to $1.3 billion were recorded, bringing the totals for the year so far to $5.3 billion committed to fund 408 transactions. The four most active venture capital firms of the third quarter of 2004 each participated in five financings. In comparison to the year-ago quarter, there has been a downswing of 6% less capital committed to 11% fewer venture financings. The pharmaceutical, biotechnology, biopharmaceutical and medical device sectors are still attracting the greatest attention from venture capitalists. 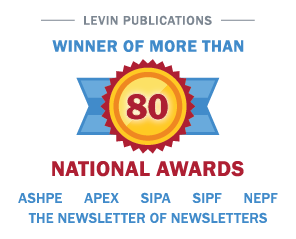 The monthly newsletter Jenks Healthcare Business Report and its companion annual report, The Health Care Venture Capital Report, are published by Irving Levin Associates, Inc., a leading health care financial publisher established in 1948. The Firm has headquarters in New Canaan, CT and is online at www.levinassociates.com. This privately held corporation publishes research reports and newsletters, and maintains merger and acquisition databases, on the health care and senior housing markets. For more information on Jenks Healthcare Business Report, please call 1-800-248-1668. HEALTH CARE M&A DEAL VOLUME UP IN THIRD QUARTER 2003, ACCORDING TO NEW REPORT FROM IRVING LEVIN ASSOCIATES, INC.